Shooting Guard has very few punt options today, and that's kind of terrifying if you're like me and hardly ever spend more than $5,000 here. Gary Harris tops our list today at home against the Celtics (28th), although that matchup is surprising considering Avery Bradley is back and is a great defender. Seth Curry gets a cushy spot at home against the Brooklyn Nets, but his price has ballooned to $6,700 and it may be hard to take him over a couple other options. Dwyane Wade is back and healthy enough to play, drawing a fast paced offensive matchup with the Houston Rockets (19th). Nicolas Batum is underpriced and coming out of a slump, has a decent matchup with the Magic (14th) in what should be a good game. 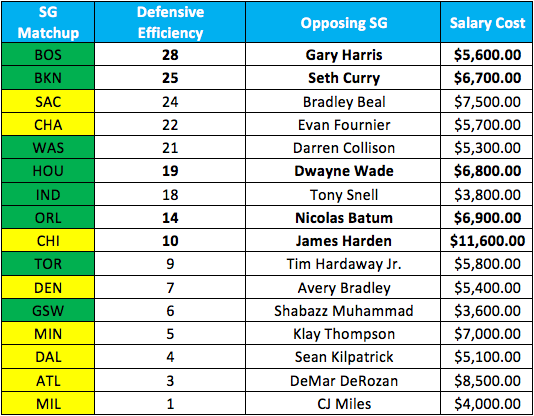 James Harden is underpriced for his regular production and Dwyane Wade's defense has been suspect at times. DeMar DeRozan draws a very tough spot at the Atlanta Hawks and teams have been doubling up on him without Lowry, I will not be going there. Shooting Guard is an interesting position, expect spread out ownership. Small Forward has a couple of my favorite plays on the slate, and is very soft overall from a defensive efficiency standpoint. Jimmy Butler draws a killer matchup at home against the Rockets who have just been brutalized by Small Forwards (30th in DE). Jae Crowder plays at Denver with Danilo Gallinari questionable, Andrew Wiggins gets to tee off on whoever the Warriors roll out against him with Durant dead, and Khris Middleton plays at home vs a very bad Pacers team that will probably get blown out again. Harrison Barnes has a home game against the Nets (17th) where he should have an advantage over most everyone on the other team. Terrence Ross and Caris LeVert have the most difficult matchups available, and should be completely avoided. Overall Small Forward is my favorite position, with many worthwhile options to consider. Power Forward looks almost as good as Small Forward today, so I guess we are just loading up with Forwards! Serge Ibaka is the top dog here, with the best possible matchup for his position (the Hawks are 30th in DE) and a price decrease has him looking very nice, followed closely by Dirk Nowitzki at home against the Nets (28th). Gorgui Dieng plays at home against the struggling Golden State Warriors who have been surprisingly bad against the Power Forward position (26th), and Markieff Morris gets to kick on over to the Kings in a very plus matchup as well. Trevor Booker may have double duty with Brook Lopez ruled out, securing his minutes for a good spot against the Mavericks. Wilson Chandler will again be an elite option if Nikola Jokic is ruled out again, but if not he is too pricey to take in a subpar spot at home against the Celtics. 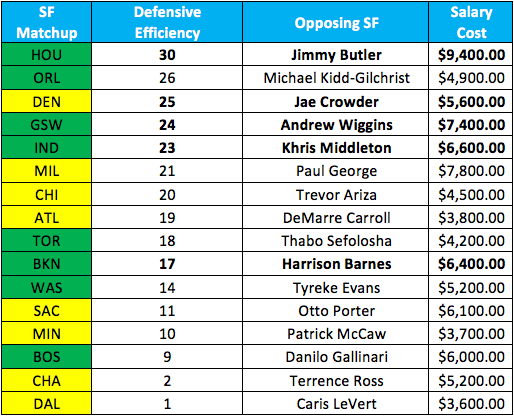 There is a lot to like about the Power Forwards tonight, and paying mid-range seems to be the best path. Center is surprisingly dull today, with few big names to focus on and build around. This is good in a couple ways, it should spread out exposure and leave a couple guys under owned in good spots. The top two spots belong to dueling big men, with Nikola Vucevic and Cody Zeller both caring very little about defense and playing plenty of offense. 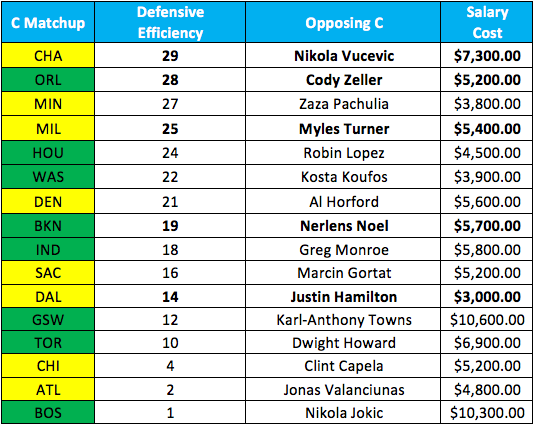 Myles Turner gets another good matchup (the Bucks are 25th in defensive efficiency) and is priced very nicely for his potential outcomes. Nerlens Noel has had some issues with fouls, but when he gets the minutes he can be destructive. He should be very lucrative against the Nets. Speaking of, Brook Lopez is out for the Nets with a sprained ankle, and one of Justin Hamilton or Andrew Nicholson should get the start and be very nice salary relief in a decent matchup. Nikola Jokic has the worst possible matchup for the Center position, but such things matter not for the Serbian God of Hoopball. 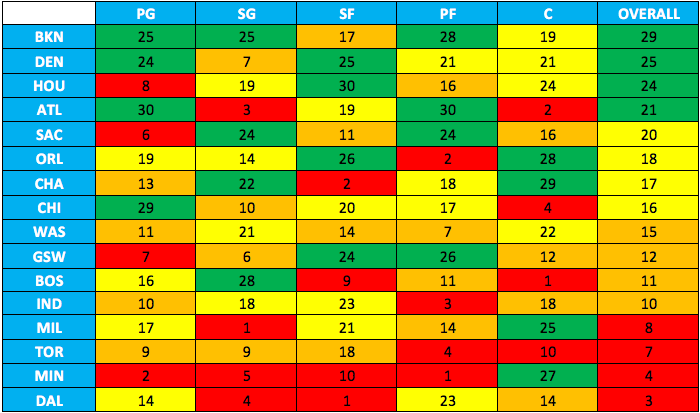 Above is the Defensive Efficiency Matrix. The Matrix, of course, shows us the strengths and weaknesses of each individual team over their last 10 games, and helps us to see how we should be attacking each team right here and now. The best Overall Stackability Score goes to Houston at Chicago, with a score of 8.5. The score isn't necessarily eye popping, but none of the games have anything super special going on from an exploitation standpoint. The biggest reason the Rockets/Bulls have the highest score is because they have collectively the worst defense of any game (an average of 20). I am all about Harden/Butler as Anchors in both Cash/GPPs, as both players will have a hefty workload in a perceived soft environment. Boston at Denver is the next best game to attack according to the efficiency stats, which comes to the surprise of no one at all. This stack won't be sneaky, but it can still be a good starting point or a way to finish off another stack with some one off players like Isaiah Thomas or Nikola Jokic. The third best overall, and the only noticeably positive score, is Golden State at Minnesota. The reason for that game is that both teams are among the top 5 in offensive efficiency over the last 10 days, but both defenses are top 10 as well. 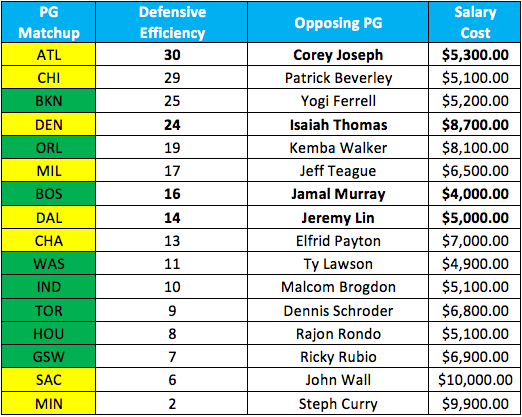 I like all three of the top stacks available, and love the less used guys like Klay/Dieng in the Warriors/Wolves game. The worst available stack tonight is the Raptors at Hawks. This comes as a bit of a surprise, but it's mainly because both teams have been awful on offense lately. I wouldn't necessarily avoid this spot, and will definitely have pieces of both in my lineups. But the numbers don't lie, and it would be wise to approach with caution. I wouldn't be stacking it regardless. Cory Joseph hasn't exactly been great while filling in for Kyle Lowry, and it has shown in the team's record and offensive overall efficiency. However, He is getting the opportunity to take shots uncontested and move the ball around while teams focus most of their energy on DeMar DeRozan. This matchup with the Hawks sets up very nicely for Cory Joseph as kind of a perfect storm. The Hawks are a worse home team, they are great at wing defense, and awful at ISO defense (Schroder is notoriously bad in 1-on-1 situations). I think we can see a bit of a breakout game for Cory Joseph here, and he is worthy of a shot in GPPs on your teams. Projecting 30, with a ceiling of 42. Nicolas Batum was in a major slump for a while, averaging only 29 fantasy points per game for a decent stretch. But, since that stretch ended, he has been right back on track with performances of 36, 40, and 35 and averaging 19 real life points to go with the other stats he puts up. The Orlando Magic rank 14th in efficiency to the Shooting Guard position, with Evan Fournier being a modest defender, and that's not anything to be afraid of. The main reason I want Nicolas Batum today is the price point of $6,900, which is just too low for someone with his upside. He averages just over 35 fantasy points, or 5x his current salary, and can routinely have 40-45 point games without surprise. I like Batum to stuff the stat sheet today, and easily pay off his price tag for a cash game staple. Projecting 39, with a ceiling of 51. Andrew Wiggins at $7,400 is not someone that people will want to play today, and that's why he is one of my favorite GP targets for the slate. The Warriors and the Wolves have been two of the best offenses in the league (both top 5) in the last ten games and since the ASB. This game should be fast paced and high scoring for both sides. With the loss of Durant, the Warriors wing defense has dropped pretty severely, opening up an opportunity for Wiggins. Ranking 24th in defensive efficiency to the position, the warriros have tried multiple players at the position but it hasn't worked and wing players have had open shots everywhere. While other people jump on Rubio and Karl-Anthony Towns, I'll be looking for leverage with Wiggins and hoping he scores in bunches. Projecting 38, with a ceiling of 46. Nerlens Noel has come into a great situation with his new squad, and as soon as his minutes are bolstered down, he is going to cost way more than $5,700. In the 2 games with the Mavericks that Noel has exceeded 20 minutes of playing time, he has racked up 47 and 35 fantasy points, both obliterating his current price tag. Now, I would be worried about playing time if Brook Lopez was active, since I would assume we see more Dirk Nowitzki manning the 5 for flexibility, but that isn't the case. I expect Noel to have 22+ minutes against a traditional center, and I expect him to eat. One of my favorite plays on the board today. Projecting 34, with a ceiling of 45. 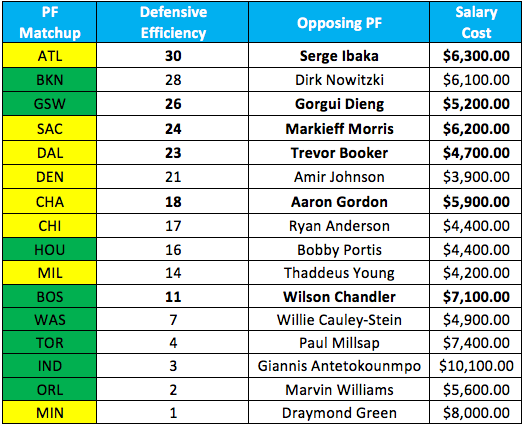 There has been a lot of chatter about lineup construction and how you should be projecting players lately, so I kind of wanted to touch on how I look at things from a production standpoint. I look at these players as a raw points play, but always expect and want over 50 fantasy points at the very least. If someone is above $10,000, I want a ceiling of 70 or so fantasy points. We need to have upside even at that price. It's important for these players to have a reasonable projection of 45+ fantasy points, with a ceiling of around 60. This is when points per dollar and value thresholds start to become important, but it's still mostly about raw points in this stage. Here, it is necessary for a player to have a realistic projection of 35 fantasy points, and a ceiling of almost 10x value (45-50 is about right). This tier is probably most important in GPPs if you are going to have a chance to take the top prize. 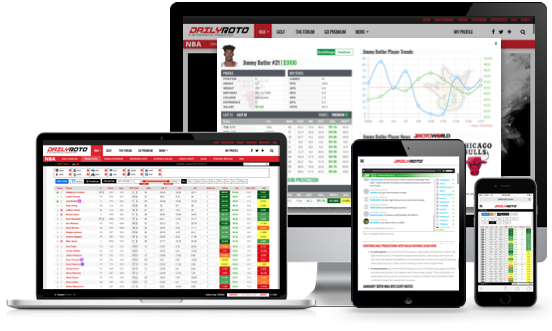 Value plays, the realistic projection must be 20 or above, and they need to routinely produce 8-10x in order to be valuable in GPPs. These players will typically be the highest owned and best place to leverage competition. There's a lot to roster construction and much more to these thoughts than I can really write about in this space, but It's important to know what to expect from players. 5x isn't enough for most cases anymore, and knowing that you need 5.5x + 5 (great writeup in the premium section about this) and the importance of production outcomes is paramount to success. This is a fun topic, maybe We can talk about it on the Periscope today!